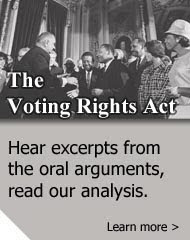 Today’s decision by the Supreme Court in Crawford v. Marion County Election Board rejecting a challenge to Indiana’s onerous photo identification requirement is a grave disappointment for those of us hoping that the Court would approach the case from the standpoint that the Constitution should encourage voting, not make it harder for people to vote. For me it was also a symbol of serendipity, as I explain below. The split decision has three Justices, led by Justice Stevens, joining an opinion that leaves the door slightly open to individual voters or groups of voters challenging such laws as applied to them. This result is preferable to Justice Scalia’s opinion for three justices that would shut the door forever to challenges to such laws, and, what is worse, open the door to any “universally applicable requirements” that could make voting difficult or impossible for many citizens. Indeed, Justice Scalia’s opinion could easily be read to support a poll tax were it not for precedent rejecting the poll tax. The real puzzle about today’s decision is Justice Stevens, who we could speculate joined Chief Justice Roberts and Justice Kennedy to avert a far more draconian majority opinion like Justice Scalia’s. 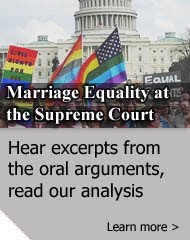 When I attended the oral argument in Crawford in January – where lawyers I knew from litigation I had done in Indiana (Ken Falk and Thomas Fisher) appeared on both sides of the case -- Justice Stevens gave numerous signals that he viewed the Indiana law as unconstitutional. For example, he pointed out that Indiana law does not require photo identification to register to vote, and pointed out to Indiana’s counsel “Is it the policy to have it tougher to vote than to register? That doesn’t make sense to me.” This sounds like the analysis of a judge ready to invalidate the law as irrational under any standard of review, an approach Justice Stevens took in an abortion case I argued before the Supreme Court in 2000, where he would pointed out that Nebraska’s abortion statute failed to serve “any legitimate interest,” a basis he identified with Seventh Circuit Judge Posner, who had written an opinion finding Wisconsin’s abortion ban irrational. Ironically, Judge Posner is the author of the opinion upholding Indiana’s voter ID law affirmed by the Supreme Court today. To what can we attribute Justice Stevens shift, other than an inclination to affirm Judge Posner? (Note that Stevens has long served as the Circuit Justice for the Seventh Circuit.) My speculation is that he worked hard behind the scenes to craft an opinion that would garner the vote of Justice Kennedy – the Court’s crucial swing vote – and somehow along the way persuaded Chief Justice Roberts. If so, this is another mark of the extreme rightward shift that the Court has taken in the wake of Justice O’Connor’s replacement by Justice Alito, for it is difficult for me to imagine Justice Stevens voting to uphold the Indiana law for any reason other than to broker a measure of moderation in the Court’s holding; unfortunately, today’s “moderation” would seem completely out of the mainstream to the Warren Court, which struck down a $1.50 poll tax in 1966.